Flashes in the Dark has published my story Akio Draws Manga. A shorter piece – under 800 words here – and an odd tale, perhaps a little supernatural, perhaps even a little sci-fi, but certainly psychological. Akio grabs a pen when he can, draws up quick, prescient sketches, while battling giant demons. This entry was posted in fiction and tagged flash fiction, flashes in the dark, horror fiction, slipstream on 9 December, 2010 by Sean Monaghan. Finding Keys, a 500 word story and another entry for the Halloween contest – themed space “not outer space, but the space between things” – has just come out on MicroHorror. Another story with the protagonist waking in a hospital bed – my other entry Airhead started the same. Both go in very different directions though. This entry was posted in fiction and tagged flash fiction, horror fiction, microhorror on 20 November, 2010 by Sean Monaghan. All of my stories are special to me, for one reason or another, yet Fledgling is one of my personal favourites – perhaps the closest I’ve come to getting the whole thing right. If you were to ask me to recommend just one of my stories to read, this would be it. My thanks to the editors of The New Flesh Magazine – William Pauley III and Brian Barnett for publishing the piece – I didn’t know if it was quite the right fit, but I guess it was. Also my indebtedness to Jodi MacArthur for her invaluable feedback on an early draft of this story. Oh, what is magic realism anyway? I was looking for a way to describe this story quickly and that seems to describe it – real, but with the tiniest hint of magic. 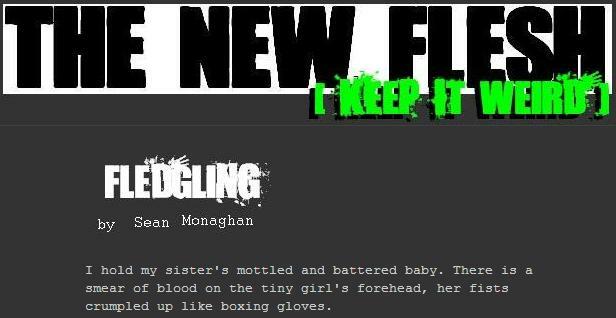 This entry was posted in fiction and tagged flash fiction, horror fiction, new flesh magazine on 8 November, 2010 by Sean Monaghan. “Airhead”, my entry for the Spaces – Halloween contest run through October at MicroHorror is up now. Nathan limited entries to a maximum of 500 words, so this is even shorter than usual. What would you do if you had the chance to right a wrong and save yourself at the same time, even if you knew somehow that the righting might be just a little evil? This entry was posted in fiction and tagged fiction contest, flash fiction, horror fiction, microhorror on 3 November, 2010 by Sean Monaghan. Another Static Movement anthology, with a very cool cover. This entry was posted in fiction and tagged horror fiction, pill hill books, print anthology, short story, static movement, zombies on 12 October, 2010 by Sean Monaghan. MicroHorror, run by the most esteemed Nathan Rosen, writer, musician and editor, publishes flash horror fiction no more than 666 words long. 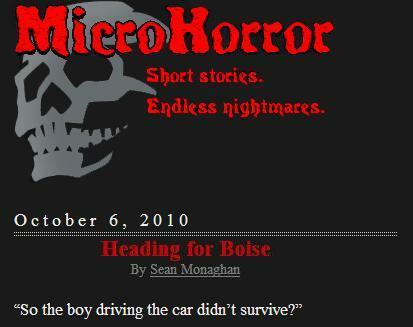 My recent piece Heading for Boise appeared on the site on October 6th. This has some of my favourite (perhaps over-used) elements – fragmented narrative, shifting viewpoints, flashbacks, a car wreck and a bit of a haunting. I was pleased with the results but still I hope it’s still readable and makes sense to readers other than me. 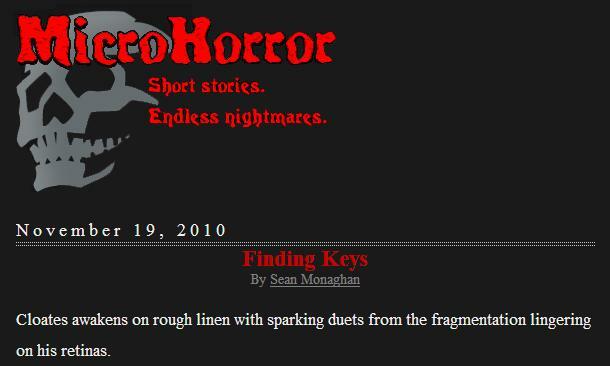 This entry was posted in fiction and tagged flash fiction, horror fiction, microhorror on 11 October, 2010 by Sean Monaghan. The October issue of Static Movement is out, with a cool range of poems and stories, including my odd little piece The Bureau of Lost and Found Souls. What if lost souls could be found, but there were a few forms to fill out before you could claim them? This entry was posted in fiction and tagged horror fiction, humourous fiction, lee kuruganti, short stories, static movement on 5 October, 2010 by Sean Monaghan.